-----Slicing parallel to the Gulf, through the coastal plain of Texas, is the Gulf Intracoastal Waterway (GICW). This watercourse is protected from the open waters of the Gulf. 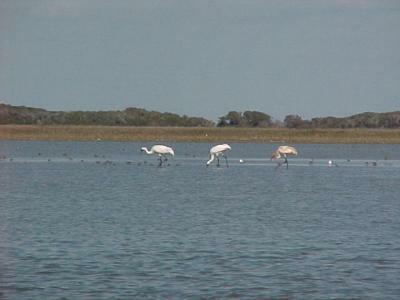 The Corps of Engineers has linked the bays and lagoons along the coast by canals. 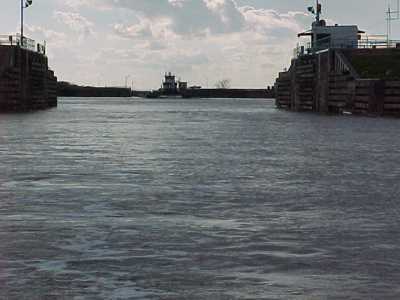 They dredge the canals and the natural watercourses to maintain a continuous navigation channel, heavily used by towboats pushing massive, heavily-laden barges. -----The GICW runs perpendicular to the rivers flowing to the Gulf and locks or floodgates are used to cross the rivers when they are at a higher water stage than the GICW. The Brazos is one of the largest rivers to cross the Waterway in Texas. -----The Brazos River is in flood. It pours southerly off the land in a pell-mell dash to the Gulf. The east-west man-made canal of the Gulf Coast Intracoastal Waterway parallels the coast at right angles to the river. The water level in the flood-swollen river is higher than in the Waterway. Massive floodgates prevent the river from diverting its course into the "ditch." To cross the river along the Waterway, operators swing the gates open for you. -----Brown, churning water pours from the river through the narrow slot toward you. Using the power of both your engines and your will, you force your boat through the narrow gap in the huge gate. The boat yaws and turns in the power of the flow and you quickly respond with a sporadic short burst of power and spin the wheel sharply. Before you have time to panic, you emerge through the slot into the river. Suddenly, new forces grip your boat. You are at the mercy of the flooding river. Whole trees, many with limbs attached, move swiftly toward you propelled by the current. As the trees surge and spin in the flow, their limbs appear to be desperately flailing like a drowning man. -----The current pulls your boat downstream -- you become just another insignificant piece of flotsam. You dodge trees and debris, as your engines force your way upriver. You continue above the open gate on the opposite side. Keeping one eye on the river and another on the narrow slit through the gate, you try, with your adrenalin-soaked brain, to resolve the mathematics of the various speeds and vectors. Your turn must be timed to the nanosecond. You spin the wheel, mumble a few words, and thrust the speed controls forward. It seems impossible. The river current quickly turns your bow to the right. 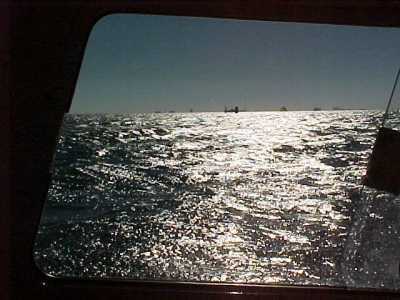 With your boat at an angle to the current, you aim your bow above the slot. At the last moment, just when the right angle flow of the water into the floodgate grips your boat, you turn the wheel and give a burst of power. The scarred walls of the huge gates slide through your peripheral vision but your focus remains dead ahead -- down the slick ramp of swiftly moving brown water and into the safety of the basin below. In a moment, it is over -- as though in a dream, your boat floats placidly in the Waterway canal. You, however, can now afford to churn and shake internally. It is long minutes before your brain and heart slow with the realization that you have stemmed the Brazos. 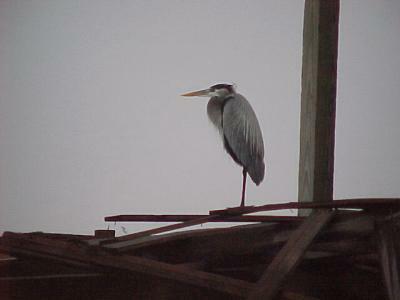 -----We are birdwatchers. The two years before moving onto Halcyon, we chased all over the continent trying to find 500 species of birds. We found #500 at Rockport. 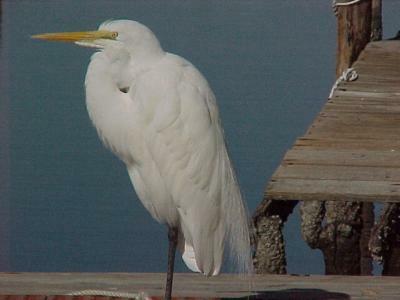 The Texas coast in winter is an ideal spot for wintering birds and we were delighted.